Fuchsia is a capability-based operating system currently being developed by Google. It first became known to the public when the project appeared on GitHub in August 2016 without any official announcement. In contrast to prior Google-developed operating systems such as Chrome OS and Android, which are based on the Linux kernel, Fuchsia is based on a new microkernel called "Zircon". The GitHub project suggests Fuchsia can run on many platforms, from embedded systems to smartphones, tablets, and personal computers. In May 2017, Fuchsia was updated with a user interface, along with a developer writing that the project was not a "dumping ground of a dead thing", prompting media speculation about Google's intentions with the operating system, including the possibility of it replacing Android. In August 2016, media outlets reported on a mysterious codebase post published on GitHub, that revealed that Google was developing a new operating system called "Fuchsia". While no official announcement was made, inspection of the code suggested its capability to run on universal devices, including "dash infotainment systems for cars, to embedded devices like traffic lights and digital watches, all the way up to smartphones, tablets and PCs". The code differs from Android and Chrome OS due to its being based on the "Zircon" kernel (formerly "Magenta") rather than on the Linux kernel. In May 2017, Ars Technica wrote about Fuchsia's new user interface, an upgrade from its command-line interface at its first reveal in August, along with a developer writing that Fuchsia "isn't a toy thing, it's not a 20% project, it's not a dumping ground of a dead thing that we don't care about anymore". Multiple media outlets wrote about the project's seemingly close ties to Android, with some speculating that Fuchsia might be an effort to "re-do" or replace Android in a way that fixes problems on that platform. In November 2017, initial support for the Swift programming language was committed. In January 2018, Google published a guide how to run Fuchsia on Pixelbooks. This was done successfully by Ars Technica. In October 2018, it was reported that the recently announced Google Home Hub may be a known Fuchsia OS test device, code named "Astro". In January 2019, a Fuchsia "device" was added to Android. Fuchsia's user interface and apps are written with Flutter, a software development kit allowing cross-platform development abilities for Fuchsia, Android and iOS. Flutter produces apps based on Dart, offering apps with high performance that run at 120 frames per second. Flutter also offers a Vulkan-based graphics rendering engine called "Escher", with specific support for "Volumetric soft shadows", an element that Ars Technica wrote "seems custom-built to run Google's shadow-heavy 'Material Design' interface guidelines". This OS is even used in the driverless car by Google. Due to the Flutter software development kit offering cross-platform opportunities, users are able to install parts of Fuchsia on Android devices. Ars Technica noted that, while users could test Fuchsia, nothing "works", adding that "it's all a bunch of placeholder interfaces that don't do anything", though finding multiple similarities between Fuchsia's interface and Android, including a Recent Apps screen, a Settings menu, and a split-screen view for viewing multiple apps at once. The second review by Ars Technica was impressed with the progress, noting that things were now working, and was especially pleased by the hardware support. One of the positive surprises was the support for multiple mouse pointers..
A special version of Android Runtime for Fuchsia will be developed. It will run on machines with this system from a FAR file, the equivalent of the Android APK. Fuchsia is based on a new microkernel called "Zircon". Zircon is derived from "Little Kernel", a small operating system intended for embedded systems. "Little Kernel" was developed by Travis Geiselbrecht, a creator of the NewOS kernel used by Haiku. ^ McGrath, Roland (12 September 2017). "[zx] Magenta -> Zircon". zircon - Git at Google. Retrieved 19 September 2017. ^ Etherington, Darrell (August 15, 2016). "Google's mysterious new Fuchsia operating system could run on almost anything". TechCrunch. AOL. Retrieved October 5, 2016. ^ Fingas, Jon (August 13, 2016). "Google's Fuchsia operating system runs on virtually anything". Engadget. AOL. Retrieved October 5, 2016. ^ Szász, Attila (November 8, 2017). "Dive into Magenta – fuzzing Google's new kernel". Youtube. Hacktivity. ^ a b c Amadeo, Ron (May 8, 2017). "Google's "Fuchsia" smartphone OS dumps Linux, has a wild new UI". Ars Technica. Condé Nast. Retrieved May 9, 2017. ^ Fingas, Jon (May 8, 2017). "Google's mysterious Fuchsia OS looks like an Android re-do". Engadget. AOL. Retrieved May 9, 2017. ^ Gartenberg, Chaim (May 8, 2017). 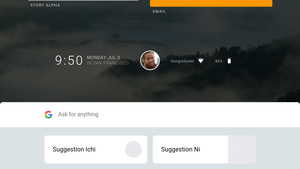 "Google's mysterious new Fuchsia OS has a UI now". The Verge. Vox Media. Retrieved May 9, 2017. ^ Davenport, Corbin (May 8, 2017). "Google's "Fuchsia" operating system is taking shape with a new design". Android Police. Retrieved May 9, 2017. ^ "First Look at all new Fuchsia OS from Google". IB Computing. IB Computing. January 18, 2018. Retrieved January 18, 2018. ^ "Add Fuchsia OS support". GitHub PR for Swift. 2017-11-15. ^ "Yes, Google Is Running Fuchsia On The Pixelbook: Calm Down". Chrome Unboxed - The Latest Chrome OS News. 2018-01-01. Retrieved 2018-01-03. ^ a b Amadeo, Ron (8 January 2018). "Google's Fuchsia OS on the Pixelbook: It works! It actually works!". Ars Technica. Condé Nast. Retrieved 22 January 2018. Right now, Google's built-from-scratch kernel and operating system will actually boot on the Pixelbook, and some things even work. The touchscreen, trackpad, and keyboard work and so do the USB ports. You can even plug in a mouse and get a second mouse cursor. ^ Bradshaw, Kyle (2018-10-10). "The newly-launched Google Home Hub is 'Astro,' a known Fuchsia OS test device". 9to5Google. Retrieved 2018-10-12. ^ "Add initial fuchsia target". 2019-01-22. ^ Bradshaw, Kyle (2019-01-03). "Google's Fuchsia OS confirmed to have Android app support via Android Runtime". 9to5Google. Retrieved 2019-01-04. ^ "Google's Fuchsia OS confirmed to have Android app support via Android Runtime". 9to5Google. 2019-01-03. Retrieved 2019-03-27. ^ Sims, Gary (August 17, 2016). "What we learned from running Fuchsia, the mysterious new OS from Google". Android Authority. Retrieved May 9, 2017. ^ Mahate, Shakeel (October 24, 2016). "Introduction". GitHub. Retrieved May 9, 2017. ^ "Travis Geiselbrecht (Projects section)". October 24, 2016. Retrieved Nov 21, 2017. ^ "Travis Geiselbrecht – Staff Software Engineer – Greater Seattle Area". linkedin.com. Retrieved 2018-11-26.